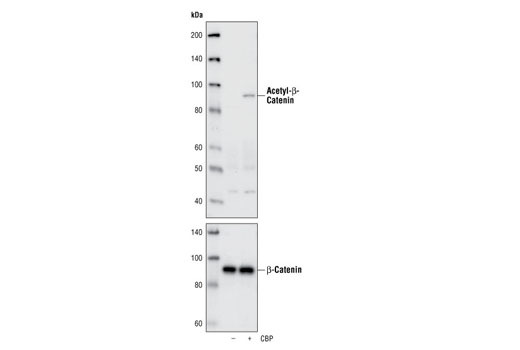 Western blot analysis of total cell lysates from 293 cells, untransfected or transiently transfected with a construct expressing CBP, using Acetyl-β-Catenin (Lys49) Antibody (Top), or total β-Catenin Antibody (Amino-terminal Antigen) #9581 (Bottom). Acetyl-β-Catenin (Lys49) Antibody detects endogenous β-catenin only when acetylated at Lys49. Polyclonal antibodies are produced by immunizing animals with a synthetic acetylated peptide corresponding to residues surrounding Lys49 of human β-catenin. Antibodies were purified by protein A and peptide affinity chromatography. Lys49 lies in a region that contains several Ser/Thr residues whose phosphorylation status regulates the stability of β-catenin and is one of few residues frequently mutated in thyroid anaplastic carcinoma (9). CBP (CREB-binding protein) binds and acetylates β-catenin at Lys49 (10, 11). Polakis, P. (2000) Genes Dev. 14, 1837-5181. Takemaru, K.I. and Moon, R.T. (2000) J. Cell Biol. 149, 249-254. Wolf, D. et al. (2002) J. Biol. Chem. 277, 25562-25567.